IGN will debut a new look at Venom sometime this week. The first entry in Sony Pictures' "Sony Marvel Universe," the Spider-Man spinoff focuses on Eddie Brock (Tom Hardy) in a world without the web-slinging superhero. Marvel Studios President and producer Kevin Feige confirmed to ComicBook.com last summer Venom operates outside of the shared Marvel Cinematic Universe, home to a young Spider-Man (Tom Holland). Brazil's Comic Con Experience offered a first look at the film's official logo, featuring a comics-inspired Venom. Sony has yet to unveil any looks at the film beyond unrevealing behind-the-scenes snapshots. 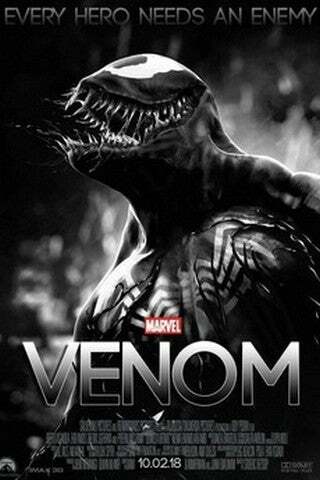 Hardy's Venom will sport a symbiote suit created by motion-capture CGI and the movie, which has been described as horror-slash-sci-fi, is expected to boast an R rating. “We’re gonna do the right one," Venom producer Matt Tolmach said when asked if the film will carry a PG-13 or R rating. Columbia Pictures president Stanford Panitch previously said the movie borrows from the works of John Carpenter and David Cronenberg but with "more pop and fun." Venom, starring Hardy, Michelle Williams, Jenny Slate, and potentially Woody Harrelson, is directed by Zombieland's Ruben Fleischer and opens October 5.